I am really conflicted about WITCHBLADE the anime, it has an interesting story and I don't even mind the GO-NAGI style character designs but it is just so exploitative that I can't really enjoy it. 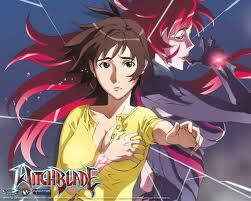 I guess my problem starts out with the fact I loved WITCHBLADE TV series. The critics called it feminist and I suppose it was, but it wasn't overbearingly so. It was a story about a strong woman, a Homicide Detective, made even stronger when she acquires the Witchblade. The Witchblade was given as a helpmate to women to even the balance of power in the ancient world. If someone unworthy wore it they would lose their arm. Though it is never said who or what created the Witchblade, it was found in Greece so think Athena or Artemis. Now in contrast take this Anime where the Witchblade and Cloneblades bond themselves to women who are hapless and selfish at best or twisted and selfish at worst. Instead of being an agent of balance, it actively throws the balance off. It takes from its wearers free will and turns them into deadly fighting machines with little mind of their own. Corporations (Men) use them to clean up their mistakes (fight monsters) battle and steal from each other. 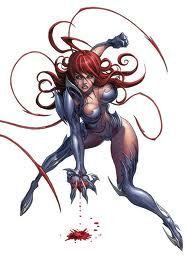 The women, for all the power of the Witchblade are nothing but victims. Even the Witchblade victimizes them, stealing all of their life until nothing is left of them but sand. The only time that the women gain any true independence and power is when they are defending a child they love. Riko, Masume's daughter is alternately threatened by the mysteriously and nefariously evil Child Services government agency, mad Scientests, various cloneblades and the Witchblade itself. Defending and protecting Riko are the only time the women of the series really find their own will, giving the Witchblade and Cloneblade true purpose. In a 24 episode series, those moments are few and far between. As I said before the character designs are very GO-NAGI and true to the original comic book, but I think that does Witchblade and GO-NAGI a disservice. These designs dip below fan-service into vulgarity primarily because they emphasize the females role as a victim and and a object, versus a power in her own right. It amazes me how strongly the special edition cover art drawn by the original American comic book artists versus the Japanese cover art really emphasizes that dichotomy.